Choosing a toy for your children isn’t a hard thing to do now, especially if your children are obsessed with Marvel heroes or watched the movie Marvel Avengers infinity wars. And even some people assume it’s not age limited. By the end of the article, you’re going to find out, people aged twenty and more than twenty too, bought the package for fun. It’s not just for collectors, but really, it’s for anyone that just loves the Marvel Avengers. This version of the LEGO toy is taking us to a whole new level of creative play to children; it will allow them to do multi stuff about their favorite heroes, from the Black Panther lovers and building their castles to playing with the most loved heroes there in the series. It contains four hundred and sixteen pieces, which will allow your children to play with them for a long time, forming different forms and shapes of the Infinity War and so on, although if you’re older and like to collect small figures, you’ll have many figures for the Infinity War favorite heroes. Your child can build Wakandan walls with an opening gate, which is assumed to be really fun for children, adding the two shooting turrets to the Wadaknan wall would let everything go better in the day for your children, also it contains the Infinity Wars, Infinity stone element, which is a cool addition. The LEGO Marvel Super Heroes Avengers Infinity War Corvus Glaive Thresher Attack 76103 contains five figures from the Infinity War series, namely Vision, Shuri, Black Panther, Corvus Glaive and Outrider figures. Want to have some fun with your children? It’s not a hard pick when it comes to toys anymore. The LEGO toy is suitable for boys and girls, aged from seven to fourteen years old, maybe if your child is aged more than fourteen years old and still obsessed with the Marvel Avengers, I guess the time would extend further more. 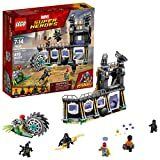 The LEGO Marvel Super Heroes Avengers Infinity War Corvus Glaive Thresher Attack 76103 is designed very well that you could sense the movie in it, it doesn’t need an obsession with marvel avengers or the movie, although that would add a thing to the package, but the package is made with many pieces that provide a clear image to the movie and clear image to the marvel avengers themselves as overall, which is a great pro for the product. The Shari hair isn’t the same of the Avengers movie, it is the same of the Black Panther official movie so far, it could be a small mistake, but it makes a slight difference when we’re talking about the Avengers’ movie package. Overall, the LEGO set has Zero negative reviews. It’s having good reviews so far, which will allow you to have more trust with the LEGO Marvel Super Heroes Avengers Infinity War Corvus Glaive Thresher Attack 76103 product. Head over to Amazon.com to get the LEGO Marvel Super Heroes Avengers Infinity War Corvus Glaive Thresher for the best price.